Dave & Buster's is seeking rapid unit expansion in 2018, forecasting growth of about 14 percent this year, or about 14 new locations. Adding brands like Dave & Buster's to malls has become increasingly important to landlords and real estate firms, especially as foot traffic in these locations continues to decline. The company is testing out an even smaller model of its typical Dave & Buster's layout in Arkansas this year. That location opened this week. As traditional mall anchors shutter, there's one brand that's staying the course on its expansion plans in 2018 — Dave & Buster's. The company, best known for its arcade games and sports-bar food, has high expectations for increasing its number of locations this year, forecasting growth of about 14 percent this year, or about 14 new locations. That includes one new location opened in Arkansas this week and another that is slated to debut next week on the second floor of what was once a Sears at the Willowbrook Mall in Wayne, New Jersey. "We are growing at more than 10 percent a year, most folks are not growing at that kind of pace," CEO Steve King told CNBC. As of Dec. 29, Dave & Buster's had signed 29 leases for locations that are expected to open between now and 2019. While the company reported in early January that sales were weak in December, King said he remains confident in its unit growth plans. Especially, as the company begins to roll out locations with smaller footprints. 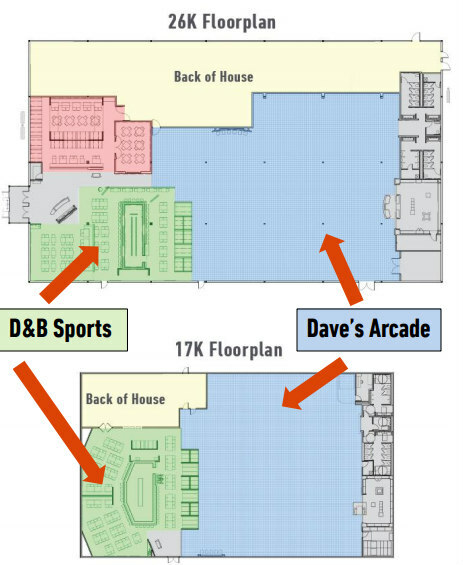 Dave & Buster's locations tend to be between 25,000 to 43,000 square feet depending on the locations, but the company is testing out an even smaller model, about 17,000 square feet, in Arkansas this year. The smaller location opened this week, and is aimed at helping the company expand in areas with a smaller population density, King said. These smaller locations maintain the size of the arcade, but shrink the space for back-of-house operations and eliminate dedicated spaces for special events and the dining room. However, D&B Sports, a bar and dining area, is larger in size. 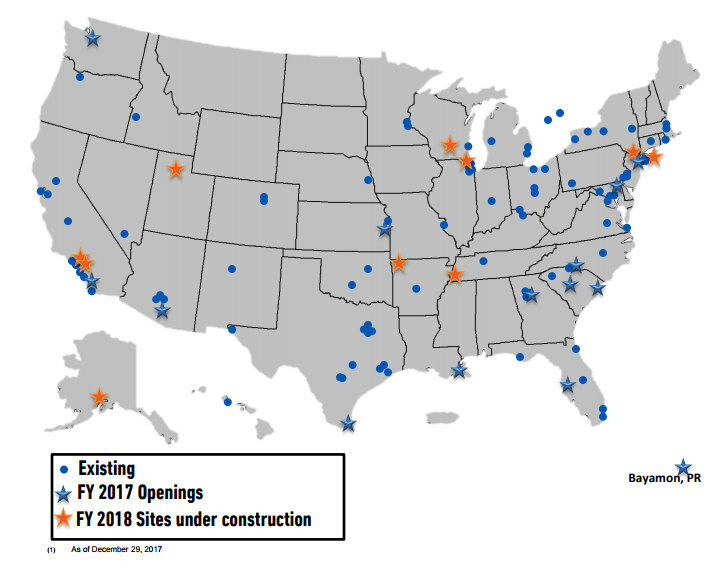 While the company currently operates a little more than 100 stores, King said it has mapped out nearly a hundred more sites across the U.S. that would be considered suitable locations for Dave & Buster's and would not cannibalize existing stores. For comparison, the company's top competitors, Main Event and Top Golf, each have about 40 locations in the U.S. Both feature dining, but Main Event pairs that with bowling, billiards and laser tag, while Top Golf allows customers to work on their golf swings. This new breed of entertainment-dining venues, sometimes called eater-tainment, is highly sought after by mall operators and real estate developers because the venues give consumers a reason to keep coming out. This is especially important as retailers struggle and shutter stores. In particular, Dave & Buster's expansion has benefited from the fall of retail giants like Sears. Vacancies in mall locations have offered it a chance to snag prime real estate in highly trafficked areas, including the outside "anchor" spot. In 2017, Dave & Buster's opened 14 new stores, seven of which were located in malls. Typically, about a third of the company's locations are in shopping malls, with the other two-thirds split evenly between free-standing buildings and locations that are in semi-attached buildings, like strip malls, King told CNBC. "Mall developers like us," he said. "They can measure that we drive traffic to their malls in a way that an anchor might have done previously." King called the vacated Sears locations "a good fit," noting that they provide Dave & Buster's with three key things: access to major roadways, high visibility and lots of parking. "Given the size of the available locations, it fits fairly well for [Dave & Buster's]," Lynne Collier, analyst at Canaccord, told CNBC. "They are a big traffic driver and generate strong sales, so landlords would like to have a Dave & Buster's on property," Collier said. Dave & Buster's has a flexible real estate model, according to Collier, which allows it to operate within malls and as stand-alone locations. While a Dave & Buster's can easily fill one floor of a vacant Sears location, often these stores have three floors. At so-called A malls, operators can fill the massive space by splitting it up among entertainment brands like Dave & Buster's, fitness centers, grocery stores and off-price apparel companies like Burlington or TJX's TJ Maxx or Marshalls, Garrick Brown, vice president of retail research at Cushman & Wakefield, told CNBC. They can even charge higher rent to new occupants and boost the mall's income. However, for "B" and "C" malls, which may not be in prime locations or have already faced bankrupt companies fleeing their storefronts, filling that massive space can be a bit more difficult. King said that mall operators have been seeking out Dave & Buster's "quite aggressively" to fill these spaces, but that the company has been careful about choosing the right locations to move into. He said that declining mall traffic has not been good for the brand and it's just one piece of why the company struggled with sales in the last quarter. Dave & Buster's cut its sales and profit outlook for 2017 last month, citing slower-than-expected sales during one of its traditionally strongest seasons. In the wake of that sell-off, Dave & Buster's stock remains down 15 percent. The company has not disclosed when it will report fourth-quarter earnings. However, when it issued its profit warning, it said its newer locations were outperforming its older ones. King told CNBC that the company has been able to continue to lure in customers because it is "destination-oriented." "The way I say it is that they are much more likely to buy a pair of socks after they go to D&B than go to the mall to buy socks and then go to D&B," King said. That's because entertainment locations offer experiences consumers value rather than just monetary transactions, according to Warren Solochek, senior vice president of industry relations at NPD Group. "The mindset of the American consumer is 'I have a pretty limited set of funds and so I am going to spend that money in a place where I am going to get more than just the opportunity to buy stuff,'" he told CNBC. That's putting "eater-tainment" like Dave & Buster's, iPic movie theaters and Sky Zone trampoline parks in demand. Solochek said that even locations like Sephora can entice in consumers because of the experience the one-stop make-up shop offers its customers. Brown said that 10 years ago, the average mall had about 10 percent of its space dedicated to food, beverage and entertainment properties. Today, it's 20 percent, Brown said. He expects that number to creep closer to 30 percent in the next few years as more malls open unique and experiential concepts. "As traditional anchors go dark ... they will need to be a lot more innovative," he said of mall operators. "Because of the convenience of e-commerce, you have to give [customers] a reason to come to your store or shopping center."